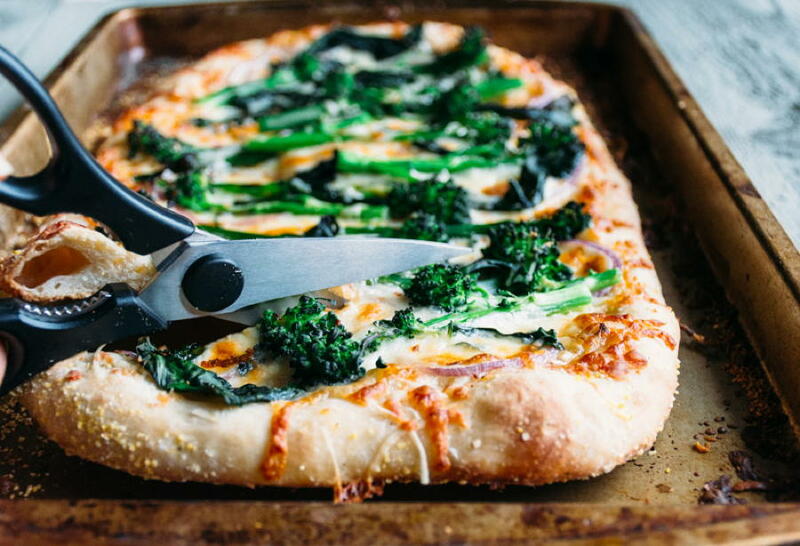 because sometimes green vegetables want to party on your pizza too! 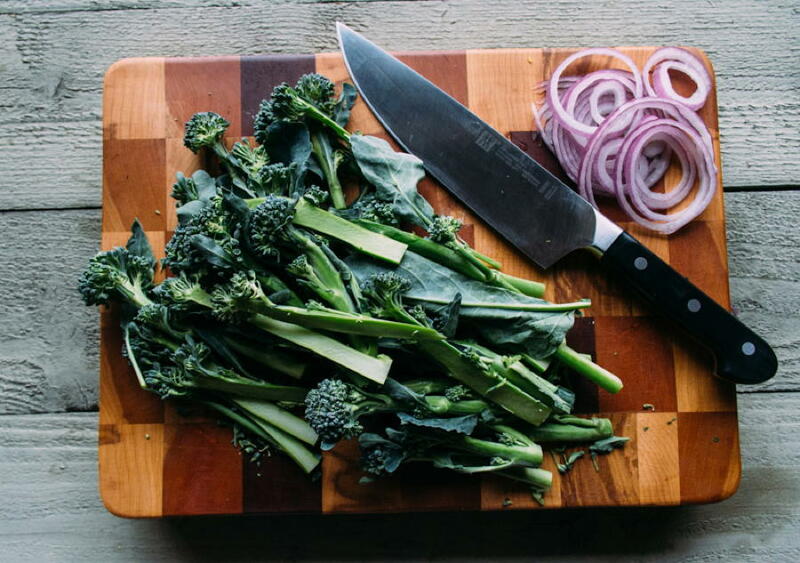 that’s when broccolini and red onion pizza comes in to the picture. on most days if I make a homemade pizza there’s usually a big green salad to go with it, but sometimes the days are long and time is short and I just go ahead and add our daily dose of green right on the pizza. because we are adults and we get to make those kinds of decisions. I also think that allowing yourself shortcuts like that are the key to actually getting a homemade meal on the table instead of giving up and eating out instead. not that there’s one. single. thing. wrong with treating yourself to a meal at your fave restaurant, but personally I like that to really feel like a treat and not like a compromise. unless of course it’s a matter of a dinner disaster. I have totally been there. read: that night I tried to make goulash and spaetzle for the first time ever (after getting off work at 6 pm) and by 9pm I gave up trying to make it “taste better” and we finally migrated to our favorite pub for reuben’s and an encouraging beer. in that case, the eating out compromise was for sure the right choice. real life = kitchen fails happen. but back to pizza with green vegetables. pizza that definitely doesn’t feel like a 2nd place meal. which makes it a definite winner, especially if you have a favorite spot to pick up a delicious pre-made dough. here in seattle quite a few stores carry the essential baking company’s dough which is delicious, or whole foods makes a pretty tasty one too. 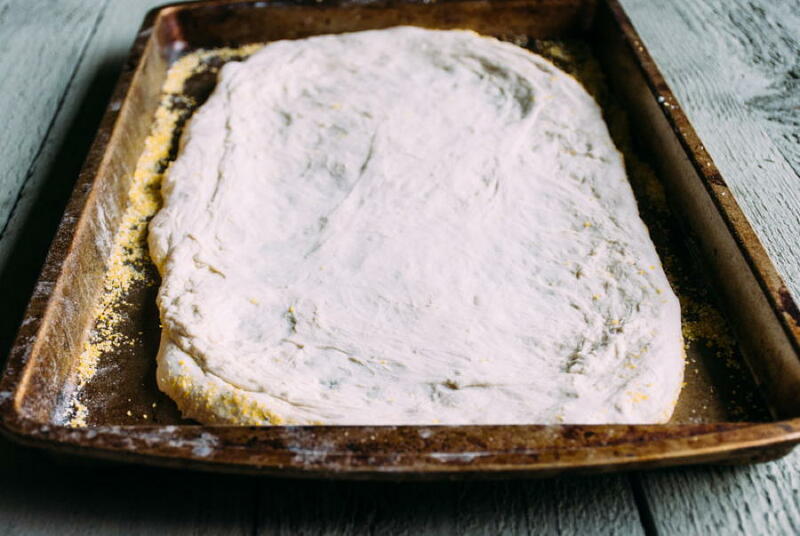 and if you are one of those dough warriors who knows how to make a badass pizza dough – can you invite me over and teach me how? I promise I’ll bring some really good wine. but really (invite me over!) you can go any route you want with the dough. buy pre-made or make your own. I would offer my own recipe but I obviously have yet to find one that I want to sing the wildest praises about. 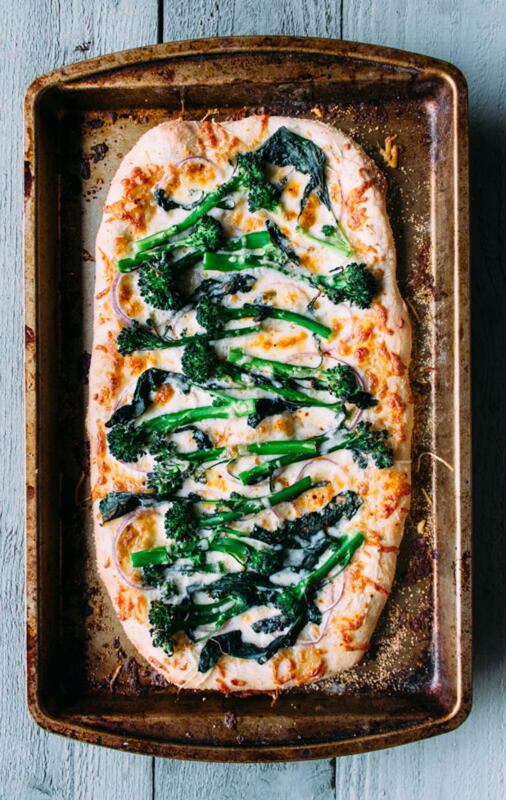 so in the spirit of simple dinners that may not be the perfect image of health but have few ingredients + GREEN VEGETABLES; here is the recipe for broccolini and red onion pizza. hope you enjoy as much we did. 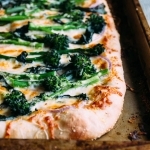 an easy recipe for pizza with broccolini, red onion, mozzarella and parmesan cheese. ideally, bring pizza dough to room temperature before beginning. while dough is coming to room temperature slice broccolini (if the stalks are thick), bring a large pot of salted water to boil, and fill a large bowl with ice water. boil broccolini for 2 minutes until crisp tender. move to ice water to stop the cooking. once cool, lay out to dry on a kitchen towel. spread cornmeal on baking sheet. press dough into a long oval shape, being careful to lift every once and awhile to assure that the dough isn’t sticking to the pan. if it keeps stretching back leave it alone for about 10 minutes so the gluten can relax, and then try again. 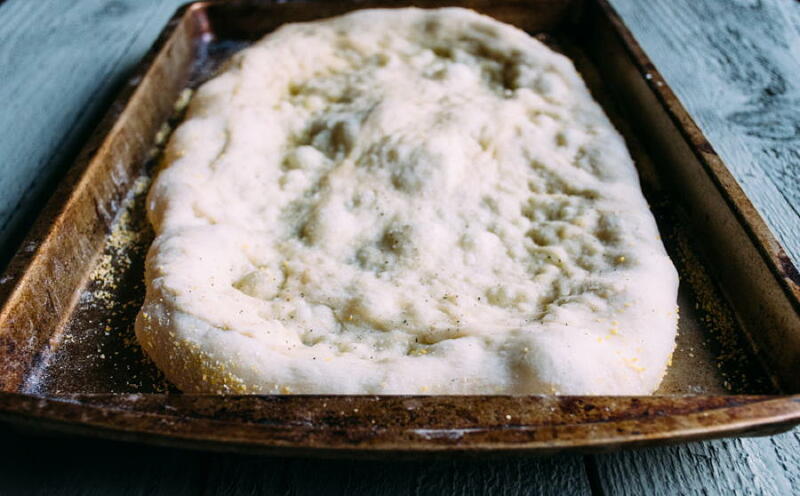 spread 1 tablespoon olive oil, a few pinches of salt, 1/4 tsp garlic granules and black pepper on dough and bake by itself in the oven for about 4 minutes. take out of the oven and sprinkle with parmesan, 1 1/2 cups mozzarella cheese and chili flakes. 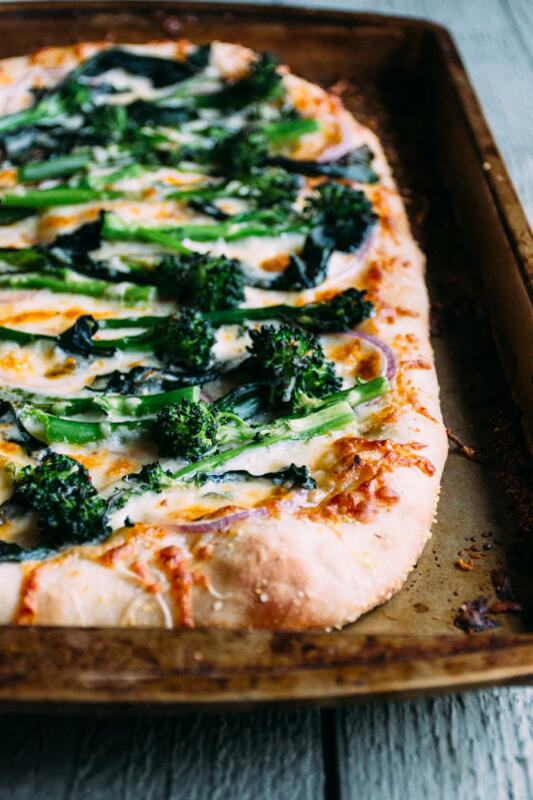 layer with red onion slices, broccolini and finish with another 1/4 cup mozzarella cheese. bake another 10-14 minutes, until crust is golden brown and cheese is melted. This entry was posted in dinner and tagged appetizer, easy, easy dinner, healthy, quick, vegetable, vegetarian on January 12, 2016 by Nyssa Tanner. I do homemade pizza pretty often, and love experimenting with hearty vegetables on them. My last two had broccoli, and I did a pesto/baby turnip combo before that. Glad to see someone else is throwing their greens right on there. Great post! And I love that your use kitchen shears to cut the pizza. In Wyoming, we have a family tradition of making homemade pizzas! I can’t wait to share your recipe for yum with Mary D and Doc Plags! Big hugs!